This Thursday, January 24th is National Peanut Butter Day. I didn’t even know they had a National Peanut Butter Day but I’m definitely on board. On a cold wintry morning, nothing satisfies the craving for belly timber more than the smooth rich taste of peanut butter. Canadians have always been a little nutty over our favourite spread. In fact, it was a Canadian, Marcus Gilmore Edson, a pharmacist from Montreal who first invented peanut butter. Edson developed a process in 1884 to make peanut paste from milling roasted peanuts between two heated plates. In 2010, Smuckers, the manufacturer of Jif peanut butter stopped selling the popular brand in Canada due to low sales. Canadians were so upset, they took to social media. It took us seven whole years, but we finally convinced Smuckers to stock Jif on our shelves again in 2017. The CBC did a story on it. There’s even a song called Peanut Butter. It was recorded by the Marathons in 1961 and made it into the top 20. Then there’s the classic struggle of loyalty and temptation between choosing Smooth or Crunchy. I started out a Smooth girl early in life, had a short fling with crunchy for awhile, then returned to my first love, definitely a smooth operator. But the main reason why we love the miracle spread so much is the nutty, salty, smooth taste that tantalizes our taste buds and spices up any meal or treat. Peanut butter is a good source of vitamin E, B6, niacin, calcium, potassium and iron, is packed with protein and is rich in healthy monounsaturated fat. This week’s #HappyAct is to spread a little cheer on a cold wintry morning with a healthy dollop of peanut butter on your toast, or rustle up an old fashioned PB&J for lunch. Better yet, why not donate a jar or two to your local food bank? 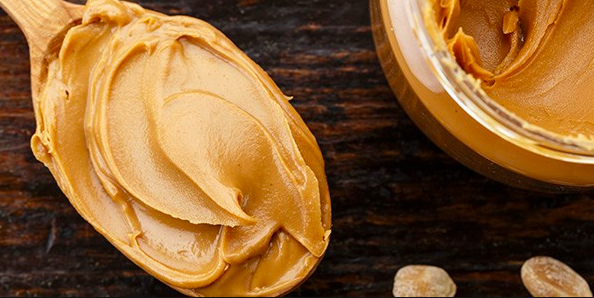 Peanut butter is always one of the highest demand items. Here’s a list of the 21 Best Peanut Butter Recipes ever from Huffington Post and one of my favourite recipes for peanut butter cookies. In a mixing bowl, cream peanut butter and butter. Gradually beat in sugars. Blend in eggs and vanilla. Add oats, flour, baking soda. Blend into creamed mixture, just to combine. Stir in chocolate chips/chunks. Drop by tablespoon onto greased cookie sheet. Bake at 350 degrees for 10-12 minutes.